Marshall Sahlins and Gananath Obeyesekere draw upon the same body of evidence — the accounts of the various eyewitnesses among Cook’s crew that were published on their return to England. Sahlins concluded from these sources that Cook’s death was plainly result of the bad luck of the timing of Cook’s two landings on Hawaii ten days apart. The first occasion coincided with a ritual cycle that led the natives to believe Cook was the embodiment of their god Lono; the second time coincided with a phase that pointed to Cook being the embodiment of the warlike god, Ku, thus obligating the natives to kill him. Mythicists who insist Paul spoke only about a celestial Jesus accuse historicists of reading into the evidence what is not explicitly there. Sahlins’ argument implies (I am relying upon Henige’s discussion here since I have not read Sahlins’ work myself) that the eyewitness accounts of Cook’s death are unproblematic and straightforward. 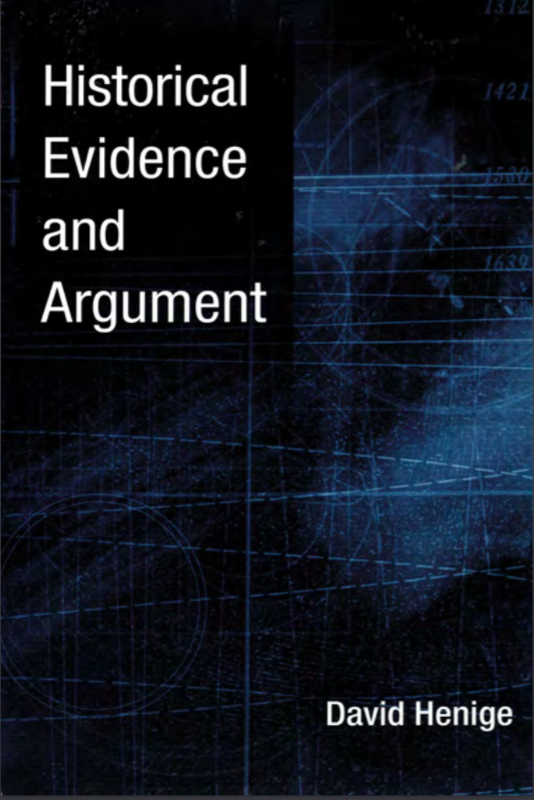 Without Obeyesekere’s disagreement with Sahlins’ interpretation neutral readers would remain unaware that “the textual evidence” is far from unproblematical. As a result, Henige argues, readers are better informed by following the argument between the two than had they only known Sahlins’ work. No doubt. It was by following the arguments between mythicists and mainstream scholars that I myself began to understand many of the assumptions and the actual evidence supporting traditional scholarship. However, the main message that Henige wants readers to draw from the quotation above is that Sahlins is emphatically wrong to denounce the negative value of scepticism. Henige illustrates the same division over the function of “too much doubting” among historians of ancient Mesopotamia. I had not been aware that a problem so prominent in New Testament historical studies had also made such significant inroads into other ancient historical studies. But I move on to related problems covered by Henige. After all, he went on, “[t]he said chronology does indeed harmonise the Passion accounts in a wonderful manner, and until [the reviewer] or anyone else has a better one to displace it, must rightly hold the field. The onus lies on [the reviewer] or others to produce a satisfactory counter-hypothesis. 22 Walker, Norman. “Concerning the Jaubertian Chronology of the Passion.” NT 3 (1959), 319, emphasis [exclamation mark and italics] added. How familiar that sounds to anyone who has read even a few New Testament reviews and arguments. Alas, the context is a dispute among Egyptologists. I place the details in the adjacent box. In discussing Josephus’ testimony about Masada, Cohen is less imperious, candidly writing that “[r]ather than simply admit ignorance, I offer the following conjectures.” Cohen then offers a scenario that, while more plausible than that of Josephus, is necessarily based on testimony in Josephus, and moreover is untestable, even though it does not conflict with the available archeological evidence. Innumerable others have perforce taken a similar line. King Arthur – Historical or Fabrication? These rationalizations—and the litany could easily be immensely longer—sound as if the more that historians believe something (or the more of them who do), the truer it is. Such sentiments betray a fundamental estrangement from honest doubt. Whether or not a theory “best” fits the evidence, vowing not to question it creates one of those self-fulfilling prophecies we all are warned about. The history of scholarship is littered with theories once thought to fit the evidence best, and sometimes actually did for a while, but were abandoned when new evidence, new techniques, and new angles of vision— including doubt—entered the picture. 27 In this case, for instance, there is a great deal more evidence (not “proof”) that the Arthur we know was created by several centuries of successive embellishment, culminating with Geoffrey of Monmouth’s farrago of specious history—culminating, but not ending, since Arthurian myth-making continues apace. It would appear that David Henige would disagree with those New Testament scholars who demand that any argument that doubts Christianity began with a historical Jesus must offer a “more persuasive” scenario of origins before they can be taken seriously. I will continue this in a future post. Henige continues his discussion of the scholarly belittling of scepticism with further specific references to biblical studies. He also asks what limits should be set on scepticism. Posted on 2015-06-17 01:00:16 GMT+0000 by Neil Godfrey. 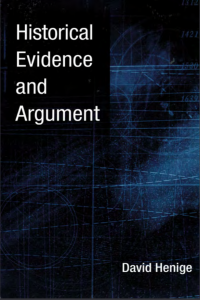 This entry was posted in Ancient historiography, Historical Methods, Historical Sources and tagged Henige: Historical Evidence and Argument, Historical Method, Scepticism. Bookmark the permalink. Whether Henige disagrees or not is irrelevant. He does not get to decide. Until we figure out how to make somebody like Henige the sole arbiter of what an alternative theory must establish before it can be taken seriously, the majority of NT scholars who demand something “more persuasive” than the current consensus win. That’s the real world, I’m afraid. The bulk of the real world of current Christian origins historical studies is riddled with logical fallacy and downright incompetence and foolishness and despite some good scholarship as an overall discipline it is not worth taking seriously. (Note Avalos and “The End of Biblical Studies”.) At least the discipline of ancient history has room for the professional exchange of the two sides. This judgement may seem a bit sweeping, but it has a sort of “secular” parallel in the so-called heredity/environment “debate” about human culture, with the social implications of scientific research, with a series of minor “martyrs” at the hands of an “egalitarian establishment”, two fairly recent examples being “racist!” James Watson and “sexist!” Tim Hunt. At one time, as a good liberal, my response to dogmatic conservatism, was classic liberalism: to advance, as an answer to dogmatism, the notion that there are many answers to most situations. Not just one. By 1990 though, conservatives knew and rejected this. So it was time to take them on, on their own turf: with their same dogmatic virulence. Often nothin else got through. So I regard the paradox of dogmatic liberalism as tactically useful at times. In our English conservative philosophical tradition, skepticism, especially towards new and untried utopian political schemes, has been a strong theme, from Hume onwards. (The USA has had a more vigorous set of ideological disputes, from Burnham to Kirk, from Leo Strauss to Ayn Rand, &c.) Of course, conservative “thinking” in my “own” right little, tight little island has been to hang on to king, priest, and nurse, for fear of something worse. My own bias is towards a sort of fallibilism. And better Popper’s Open Minds than Pavlov’s PC Pups.